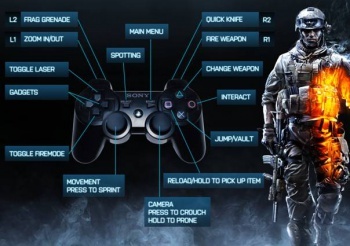 Battlefield 3 designers divulge ten tips for success in the game's beta; some are helpful, some not so much. The Battlefield 3 multiplayer beta is now officially open to anyone with a healthy Internet connection and a PC, PlayStation 3, or Xbox 360. It's been a long wait, but gamers can finally headshot and stealth-knife their peers in the war game's Rush mode, a vehicle-laden, team vs. team brawl on the map Operation MÃ©tro. The beta can be found for free in the "demo" section of either PSN or XBL. If you're a PC gamer, you'll first need to download Origin and sign up for a free account before you can get your hands on the file. Once you've downloaded the game, DICE has released ten hints to help get you started. 1. Stick to your teammates, and remember to spawn on them to stay close to the fight. 2. Use your kit specific abilities to help your teammates. Assault can hand out med kits, Engineers can repair vehicles, and Support can hand out ammo. 3. Make sure, when you have armed an M-COM station, that you defend it to make sure it is destroyed. 4. The bombed-out tunnel section in Operation MÃ©tro is an excellent place to use a flashlight as one of your weapon attachments. Use it to light the tunnels up - and to blind your enemies. 5. Attach bipods to your weapon and deploy it automatically by pushing up against cover or going prone and zooming in - this gives you a huge increase in accuracy and stability. 6. Use suppressive shooting (fire close to enemies behind cover) to negatively effect the enemy's fighting capabilities. 7. Watch out for falling debris as this can hurt you. But you can also hurt your enemies by taking out buildings with the Engineer's RPG. 8. Shotguns are excellent for CQC (Close Quarters Combat) in the tighter tunnels sections. 9. Fire automatic weapons in short bursts for accuracy, or switch to single fire mode if applicable. 10. To grab your enemy's dog tag as a souvenir, do a stealth knife kill from behind. While some of DICE's tips should be common knowledge (for instance, if you didn't already know number 8, I worry about you) some are pretty telling about what we can expect from the gameplay. We now know that debris hurts, that it's difficult see with an enemy pointing his flashlight in your face, and that you can only nab dog tags with stealth kills. It should also be noted that DICE has very cleverly made seven of its ten tips involve abilities not available in the rival Call of Duty series (or eight if you count that Battlefield 3 offers point bonuses to those offering suppressing fire). While the beta only offers one mode and one map, I'm still extremely excited to get home and download the program. If you can't grab it tonight, however, just make sure you do before October 10th when the beta ends and you have to wait for full release on the 25th.